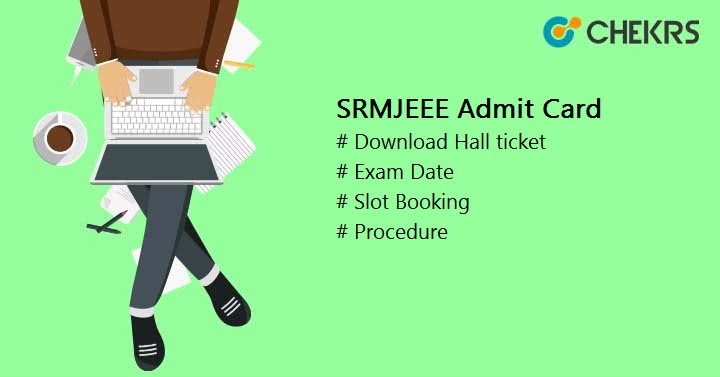 SRMJEEE Admit Card 2019 Download Here: SRMJEEE is being organized every year by SRM University for its all campuses. It is a gateway to get admission to B.Tech & M.Tech and also MBA courses. SRMJEE 2019 is a university level entrance exam which will be conducted in the month of April May 2019. SRMJEEE Hall Ticket will be released on the official website and you can download your SRMJEEE Admit Card by going through this article. The Exam dates will be in April 2019 and Admit Card will be available 2-3 weeks prior to the exam. Candidates can download the SRMJEEE Admit Card just before the exam. All the candidates who successfully submitted the Application form can download the SRMJEEE Admit Card. Candidates also have to book a slot for the examination in the SRMJEEE Slot Booking Procedure. The procedure is given below. Visit the official website and find the option for SRMJEEE Admit Card 2019. After clicking on the link you will be redirected to the login page. Choose Exam date and time and submit your choice. After successful submission, the SRMJEEE hall ticket/ admit card will appear on the screen. While I was busy in some research about the procedure, I found many query on some forum and post that ‘how to download the SRMJEEE Hall Ticketif forgot the Password?’. In this case Candidates can use “Forgot Password” option from the login page. Then, enter your email id and click on submit. Use this password to login and follow the above procedure to download the Admit Card. So you got your SRMJEEE Admit Card but before appearing in the exam, you can check some of the very common Admit Card instructions. Only candidates having Hall Ticket/Admit Card will be allowed in the Examination Room. Candidates have to carry a Photo ID Proof ‘ Aadhaar card’ along with the SRMJEEE Admit Card 2019 at the Examination center, for verification. While downloading the admit card, If candidates found any wrong personal details, They need to contact the SRMJEEE 2019 Exam Authority through the available options on the website. Candidates have to reach the venue at least 30 minutes before the examination. That’s it guys for today, We are concluding this post with the hope that you will get your SRMJEEE Admit Card 2019 easily by following the above steps. We advise you to read and follow all the instructions from the official website or Admit Card. Good Luck, Keep visiting.